More coverage of last night's 3-1 win over Merrimack. USCHO. The Boston Herald. The Eagle Tribune. With Coach Parker's 800th win, the game becomes an "instant classic" and is featured on our This Date in Terrier Hockey page. We also have an audio interview with Matt Gilroy. Playoffstatus.com is a Web site that predicts likely outcomes--final standings--for college hockey conferences and other sports, too. This is a purely statistical method of projection, based on past games. So, for example, it doesn't take into account the fact that UNH lost several games when it was forced to play a backup goalie due to an injury to Brian Foster. There''s also a "What if" page showing projections based on varying numbers of the remaining league games BU may win. As of today, the site predicts a third-place finish in regular season for BU and a 47% chance of playing for the Hockey East title. Acknowledging our bias, we think the Terriers' chances are better than that. Still, an interesting diversion. Explore a bit. 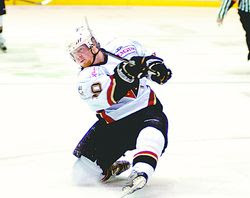 2009 recruit Justin Courtnall scored his 20th goal of the season in Victoria's 5-1 win over Cowichan Valley. His 53 points are 18th best in the BCHL. Hershey Bears forward Chris Bourque put the puck past his former BU teammate John Curry twice last night, but the former All-American netminder was the difference-maker in a 4-3 shootout win for Wilkes Barre/Scranton. Curry stopped 46 shots in regulation and overtime, then slammed the door on all four shots he faced in the shootout. With the win, he finished January with a 7-2 record and a 2.17 GAA. Matt Radoslovich scored a goal and an assist and Chris Dyment added a helper in the Trenton Devils’s 5-1 win over Elmira in ECHL play. Bryan Miller assisted on the tying goal and overtime game-winner in the Alaska Aces 7-6 win over Ontario. Miller now has 30 points. The Terriers return to North Andover for a third game with the Warriors. There, the focus will be on securing two important points to solidify BU’s second place position in the Hockey East standings and also on achieving a milestone for their coach. A win will make Jack Parker the third D1 coach to reach 800 victories. 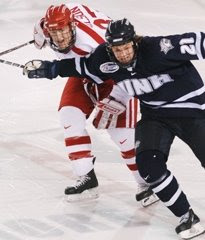 College Hockey News provides its “Tale of the Tape” matching up BU and Merrimack. From Hockey East Online, a preview of all league action this weekend. The GoTerriers.com site, as always, provides links to game notes, gametracker, the BU audio broadcast and a pay-per-view online Webcast from B2 networks. 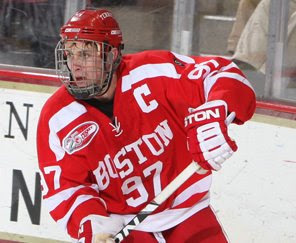 The Boston Herald, like other media we’ve posted recently, profiles BU co-captain Matt Gilroy who appears to be on track to become BU’s first three-time All-American since Chris Drury. Rick Meagher was the first and only three-time first-team All-American to play for BU. USCHO’s Hockey East Weekly Column features close-up looks at the two teams—BU & NU-- that Dave Hendrickson expects to be playing for the silver Beanpot on Feb. 9. 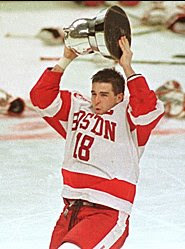 New York Daily News online hockey columnist Elliott Olshansky reports that Chris Drury will be inducted into the Beanpot Hall of Fame, where he’ll join a dozen other ex-Terriers, including Jack Parker.The article looks at Drury’s MVP performance in the 1996 Beanpot (the first in the current Boston Garden) as well as Jack Parker’s favorite Drury/Beanpot memory. 2009 recruit Max Nicastro’s eighth goal of the season was not enough to keep Des Moines from defeating the Chicago Steel, 3-2, ending a x-game Bucs loosing streak. The right-shot defenseman is third among USHL blueliners in scoring this season with 24 points. 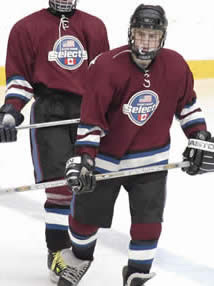 Defensive partners, longtime teammates (U.S. NTDP and other programs prior to BU) and Colorado Avalanche draft picks Colby Cohen and Kevin Shattenkirk will be together again for part of the upcoming summer as counselors at the East Coast Select Elite ’95 Camp in Buffalo. East Coast Selects is an offseason tournament and and development program that competes in tournaments all over North America. Shattenkirk and Cohen were members of ECS ’89 teams that won numerous tournaments. The ‘89s also included BC’s Nick Petrecki, Harvard’s Alex Biega (although he was an ’88), and Vermont’s Jack Downing. Both freshmen Corey Trivino and 2009 recruit Alex Chiasson participated in the ESC ’90 program. ESC president Travis Howe notes that Colby has been a counselor the past few summers and Shattenkirk did so last summer. Howe, grandson of NHL legend Gordie, plans to attend the 2009 Beanpot where he’ll see seven ESC alumni on the ice. The ECS Web site presents “development” photo features of both Cohen and Shattenkirk. As Coach Jack Parker approaches the milestone of his 800th career win, our colleague Sean Pickett (THIS DATE IN TERRIER HOCKEY) has posted Parker’s coaching record data on the BU Hockey Archives Web site. Jay Pandolfo and the New Jersey Devils practiced yesterday at Agganis Arena, but the return to campus was bittersweet for the former Terrier captain and All-American wing. He’s been a healthy scratch the past three games, ever since Brendan Shanahan rejoined the Devils. And he's not in the lineup tonight for the Devil's match-up with the Bruins. For the past decade, Pando has been a defensive force for New Jersey, combining with John Madden as one of the NHL’s best penalty-killing duos. Two of the four remaining schools in the College Hockey America conference—Niagara and Robert Morris--will be joining Atlantic Hockey, beginning with the 2010-2011 season. A third CHA school, Bemidji State, is expected to apply for admittance in the WCHA, which recently ended its moratorium on expansion. And now word comes that the remaining CHA school, Alabama-Huntsville, has applied to join the CCHA. The only D1 school in the South, Alabama-Huntsville also has the distinction of playing in a rink named for a genuine rocket scientist—Werner Von Braun. The breakup of CHA began in 2007 when Wayne State discontinued its hockey program. College Hockey News columnist Adam Wodon offers commentary on the dissolution of CHA. Just 21 hours after the final whistle in last night’s BU win, the Terriers take on the Wildcats again, this time at the Whittemore Center in Durham, N.H. The game airs again on NESN, beginning at 7 p.m. The radio broadcast on WZZN-AM 1510 can be accessed here. Sports Information Director Brian Kelley will provide an in-game blog throughout the contest. College Hockey News offers its Tale of the Tape comparison of the two squads. Tonight's game is UNH's annual "Blue Out the Whitt" event with home fans encouraged to wear blue. In addition to the NESN video feature on Kieran Millan, posted here earlier today, Inside College Hockey also looked at how the former Spruce Grove (Alb.) Saint has established himself as BU’s top netminder. Friday night's much-anticipated match-up between the #2-ranked Terriers and a surging UNH team produced a lopsided 5-0 shutout for BU and the first ever win against the Wildcats in Agganis Arena in seven tries. Sophomore Colin Wilson ended a seven-game goal-scoring drought with a pair of goals while linemate Jason Lawrence, and freshmen Vinny Saponari and Corey Trivino each added a goal. Chris Higgins, (photo: credit Melissa Wade) returned to the lineup after missing a game due to concussion and registered three assists. Netminder Kieran Millan stopped 22 shots to earn his second shutout of the season. We have links to recaps from The Boston Herald and Hockey East along with a detailed boxscore. Dave Hendrickson’s USCHO recap features a sidebar piece by Scott Weighart on Higgins' recovery. NESN video highlights are here. Below is an audio file of Coach Jack Parker’s post-game press conference (click title to play). ► BU’s 17 wins (17-5-1) matches last year’s regular season total. ► BU’s penalty killers throttled all eight UNH power plays and have 66 successful kills in the past 71 attempts. ► The shutout was the first time the Wildcats have been blanked in 76 games, a mark that had been tied with the Terriers for longest in the nation. ► The win was the 798th of Coach Jack Parker’s career. ► Trivino, perhaps playing his best game of the year, earned an assist on a shot attempt that Saponari deflected home and a goal on an attempted cross-crease pass that deflect off a Wildcat defender. He also was dominant on faceoffs. ► Wilson, whom Parker called “the best player on the ice both offensively and defensively” picked the right night to be at the top of his game. Nashville Predators Assistant general manager—and former Terrier forward—Paul Fenton was in attendance to watch the centerman whom the Predators chose seventh overall in last June’s NHL entry draft. The Terriers are back in action for a crucial home and home series with New Hampshire. Tonight at Agganis Arena—where BU has never beaten the Wildcats—and tomorrow at the Whittemore Center in Durham—where BU holds a slight edge. Currently, BU is in second place in Hockey East, two points ahead of UNH, which has a game in hand. Freshman goalie Kieran Millan is expected to be in the Terrier lineup both nights. Chris Higgins, who suffered a concussion against Merrimack and missed Saturday’s win over BC, is listed as questionable, with a decision on his availability to be made following BU’s afternoon skate. The BU Athletics Web site has links to game notes, gametracker, and the radio broadcast on WWZN, beginning at 7:30 p.m. Beginning at 6:30 p.m., Bernie Corbett hosts BU All-Access with sophomore Joe Pereira among the guests tonight. Both weekend games are being telecast on NESN. Previewing the two-game series—and Hockey East’s weekend— are articles from The Daily Free Press, USCHO, HockeyEastOnline and The Union Leader. The Concord Monitor spoke with Colin Wilson and UNH’s James VanRiemsdyk, rivals tonight, but close friends and linemates on USA Hockey U-18 and Junior National teams. Both NHL first-round draft choices, they passed up opportunities to turn pro to return to Hockey East for their sophomore seasons. ► NESN’s Tom Caron got together with BU Coach Jack Parker to talk about changes in the college game during his 36 years behind the Terrier bench and offers he received to coach the Boston Bruins. ► InsideHockey.com's Tim Rosenthal spoke with Terrier co-captains John McCarthy and Matt Gilroy about BU's tight-knit senior class and how they've led the team's resurgence this season. 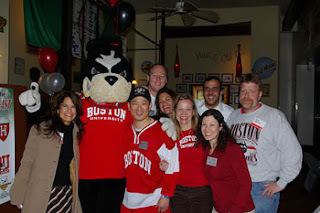 DC-area readers of the Terrier Hockey Fan Blog are invited to join other BU alumni at their annual Beanpot Viewing Party at Regional Food and Drink (RFD)on February 2nd for the preliminary games. Alumni from the Metro DC area will take over the entire bar, turning it to a sea of Scarlet and White. Alumni from any of the other Beanpot schools—or any college hockey fan, for that matter— are welcome to join us. RFD will be “Terrier Central” from 4:30 p.m. until the last whistle is blown. Tickets are $15 in advance (or $20 at the door) and are available from the club’s Web site. ► For list of Beanpot viewing parties throughout the U.S. and registration information, click here. Co-Captain Matt Gilroy, with two goals and an assist in the wins over Merrimack and Boston College, was recognized as Hockey East’s Pure Hockey Defensive Player of the Week. The Toronto Sun reported that the Maple Leafs will be among the teams bidding for Gilroy’s services at the end of the season. Gilroy is an undrafted free agent. The Terriers, now 16-5-1, remained in second place in both national polls, behind Notre Dame. The New York Times’ Slapshot blog reported on Saturday’s 5-2 victory over BC. 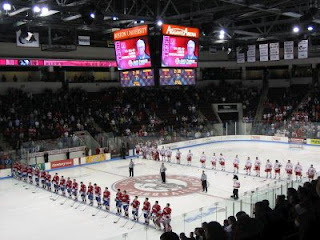 Blog contributor CDRAL notes that like most BU-BC games at Agganis, there was a healthy contingent of ex-Terriers on hand. Among them: Mark Hetnik, Dennis O'Connell, Brad Zancanaro, Brian Collins, Blaine Maus, Matt Marden, Mike Eruzione, Bob Murray, Jack O'Callahan, Kevin Kielt, Billy Hinch, Karson Gillespie, Tony Ruvolo, Dan Ronan, Tom O'Regan, John Danby, and Mike Prendergast. Junior center Luke Popko, whose on-ice chemistry with Zach Cohen has help BU’s fourth become an offensive threat, was interviewed on BU All-Access last week. To listen to the segment, click here, then choose “Free Events” and scroll down to 1/14. Former Terrier Chris Bourque, who has been called up the NHL by the Washington Caps twice this season, will be in the lineup for this Sunday’s AHL-All-Star game. Ryan Whitney was the subject of the “Name that Squirt” video during Sunday’s NBC broadcast of the Penguins-Rangers game. Moment later he threaded a perfect pass to send Peter Sykora in alone for a goal. Playing perhaps their best game of the season, the Terriers dominated BC, 5-2, to win the regular season series (2-0-1) and move into second place in Hockey East, four points behind Northeastern. After Eagle goalie John Muse held BU at bay in the first period, stopping 18 shots, the Scarlet scored on four of ten power plays and added one even-strength goal. BU outshot BC 46-21 and the Terriers attempted 81 shots. Photo credit--Justine Hunt/The Boston Globe. "One night after being benched by coach Jack Parker due to a lack of defensive focus, blueliner Colby Cohen went from doghouse to top dog, earning top star honors with a goal and an assist on top of a solid showing in his own end. " We also have recaps from The Boston Globe, The Boston Herald and Hockey East Online. Detailed boxscore. Video highlights. We also have an audio file of Jack Parker's post-game remarks to the media below. ► Nine of Warsofsky's 14 assists have come in the last seven games. ► Nick Bonino’s 2nd-period power play goal ended a six-game goal-scoring drought. His last previous goal came on a lunging clear that found its way into an empty net in the waning seconds of the Dec. 6 win at BC. ► Colin Wilson , who has a team-leading 26 points, was dominant on faceoffs winning 17 of 25 draws. Bonino won 8 of 12. ► The victory was Coach Jack Parker’s 797th career win and 71st against BC (71-55-12). 2009 recruits Alex Chiasson and Max Nicastro went head-to-head last night with the latter's Chicago Steel winning, 4-3. Nicastro's assist gives him 23 points, second among all USHL defensemen and trailing only his teammate, John Moore, a Colorado College recruit. Chiasson continues to have a hot hand for Des Moine, scoring twice--his first multiple goal game for the struggling Bucs. The right winger from Quebec has taken over point leadership on Des Moines with 28. Justin Courtnall contributed an assist and earned the game’s third star as Victoria doubled up Powell River, 4-2, in BCHL play. Former Terrier Matt Radoslovich scored twice on Friday to pace the ECHL Trenton Devils to a 3-2 win against Dayton. On the game-winning goal, he was assisted by former BU co-captain Chris Dyment. The Patriot Ledger offers a feature article on the high school coaching careers of brothers Bob and Jim Sylvia. Bob Sylvia, who has been behind the Quincy High School bench for 43 seasons, was co-captain of Jack Kelley’s first winning team at BU. The 1964-65 team finished with a 25-6 record and began a 15-year period of dominance in Eastern hockey. All-Star Game, to be hosted by the Sioux Falls Stamepde on Wednesday, February 4, 2009. Chiasson was the only player to be selected from Des Moines. Former BU goalie Brett Bennett also was named to the Eastern Division team. Earlier this season, Nicastro played for the winning Team USA in the World Junior A Challenge and scored a power play goal in the gold-medal game. Justin Courtnall, also a 2009 recruit, played for the Interior Division team, which was thumped the Coastal Division, 12-5, in the BCHL All-Star game last night. Salmon Arm’s Conor Morrison, who scored twice for the Interior Division, is, according to several sources, on the recruiting radar of BU and Wisconsin, among others. Like Chiasson, he previously played for Northwood Prep and graduated from that school. 2011 recruit Charlie Coyle scored on a breakaway 59 seconds into overtime to give Thayer Academy a 1-0 upset win over Belmont Hill is New England prep action. Coyle, a cousin of ex-Terrier and NHL star Tony Amonte, was a standout in the 2008 Select 16 Festival, earning kudos from USHR: "Charlie Coyle (#18 Black/Thayer Academy) is the top finisher on the undefeated Black team, and is another who has made a big statement here." Former Terrier co-captain and current radio broadcast analyst Tom Ryan is featured in The Boston Globe today. This season, he’s returned to his high school alma mater, Newton North, as head hockey coach and aims to return the Tigers to the top level in Massachusetts schoolboy hockey. BU’s eight-game unbeaten streak (7-0-1) came to screeching halt as Providence upended the Terriers, 4-2, last night at Agganis Arena. The Friars new goalie, Alex Beaudry stopped 39 of 41 BU shots, while the visitors capitalized on three BU errors and a 5-on-3 power play. 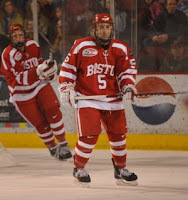 BU received power play goals from seniors Chris Higgins and Brandon Yip (photo). Following the game, BU Coach Jack Parker (audio clip) said, “I want to give Providence a lot of credit. It's the first time we've had a team come in here and outplay us. I'm not upset with my team. We played hard, they played harder. It wasn’t like we cruised out there. Their goaltender played very, very well." 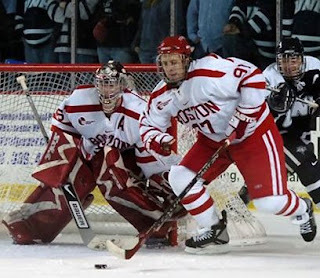 We have recaps from The Daily Free Press, USCHO and The Boston Herald. Detailed boxscore. Video highlights. BU has two days to regroup before this weekend’s games at Merrimack and at home against Boston College. BU returns to the ice tonight for its final Tuesday game of the season and its first meeting of the year with Providence. The Friars are on a two-game winning streak while the second-ranked Terriers are unbeaten in the past eight games (7-0-1). BU’s Web site has links to game notes, gametracker and the audio and video Web casts. We also have a link to Providence game notes. ► The win extended BU’s unbeaten streak against the Black Bears to ten. ► Brandon Yip is the leads all current Terriers in points against Maine with eight, but Saturday’s goal on rebound was his first (1-7-8). ► BU has now scored in 15 consecutive periods. One streak that ended was the Terriers’ successful penalty-kill run that reached 28 before Robbie Dee’s power play goal in the first period. BU held Maine at bay during four more man-advantage situations—including a 5-minute power play. BU now has killed 39 of the last 41. ► Entering the third period with a two-goal lead, BU clamped down on the Maine offense, allowing just three shot—one a center-ice clear-in—during the final 20 minutes. ► Freshman Kieran Millan, with a 6-1-1 record, has the best winning percentage among Hockey East goalies at .812. 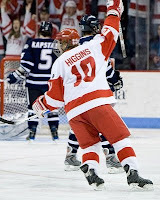 ► Eight of Chris Higgins’ nine goals have come in Hockey East games, including a pair of game-winners. ► Chris Connolly (photo) has had five two-point games this season and has 14 points overall. He’s tied for second in freshman scoring in league games with 5-4-9. ► One battle the Terriers didn't win was faceoffs where Maine had a 32-24 advantage. It was just the second time during the current eight-game winning streak in which BU was on the short end of draws. 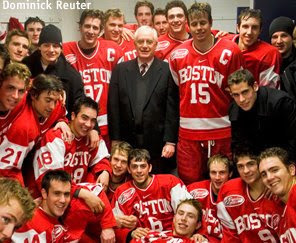 ► Bostonia Magazine’s Winter 2008-09 issue features an interview with Terrier head coach Jack Parker in which he looks back at his 35 years behind the Terrier bench. ► Three Terriers are among those named for the Hobey Baker Award fan vote: Yip, Gilroy and Colin Wilson. Boomer Ewing, third in scoring in the ECHL (22-24-46), may soon find himself reunited with John Curry in Wilkes Barre/Scranton. Bryan Miller is fifth in the ECHL among defensemen with a 6-18-24 line, which is best on the Alaska Aces. Miller was an ECHL All-Star last season with the Aces. Terriers and the Maine Black Bears face off tonight at Agganis Arena for the 100th time. The teams first met in the 1923-24 season, but didn’t play again until 1979. BU leads the series, 48-42-9. The Terriers welcome sophomores Colin Wilson and Kevin Shattenkirk back to the lineup while Maine defenseman Simon Danis-Pepin is expected to return from an injury. We have game notes and links to game tracker and internet audio and video broadcasts. The Kennebec Morning Sentinel previewed the game from the Black Bears' point of view. The first 2009 installment of BU All Access will air today at 6 p.m. ET, prior to the Maine game, on WZZN and online. Last night’s Hockey East schedule produced a pair of games tied in the final seconds on extra-attacker goals. UMass pulled even with New Hampshire with just four seconds remaining, while Vermont knotted its game against BC with just one second left in regulation. 2009 recruit, defenseman Max Nicastro scored Chicago’s first goal and then assisted on the game-winner in the Steel’s 2-1 win against Cedar Rapids. The California native has eight points in his past eight games and 19 points overall, one fewer than last season. 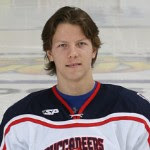 Alex Chiasson’s 11th goal—unassisted on a power play—put Des Moines on the board against Lincoln, but it wasn’t enough as the Bucs fell again, 4-2. Chiasson has 22 points in 24 games. Former BU All-American goalie John Curry earned his seventh win in nine starts—a 4-2 win over Binghamton—since being returned to Wilkes Barre/Scranton from Pittsburgh. Former Terrier Captain Sean Sullivan assisted on both goals in the San Antonio Rampage’s 2-1 win against Milwaukee. David VandGulik’s 10th goal of the season tied Quad City with Toronto in the third period in a game the Flames won, 3-2, in overtime. Boomer Ewing scored his 20th goal in 33 ECHL games and added an assist but the Wheeling Nailers were doubled up, 8-4, by Dayton. With holiday tournaments complete, Hockey East teams are focused on conference play. The Boston Globe’s Nancy Marrapese-Burrell looks at what’s ahead for each of the teams. INCH’s Jeff Howe offers up New Year’s resolutions for each league team. And in his weekly Hockey East column, USCHO’s Dave Hendrickson features comments from the coaches’ press conference on how they assess their clubs at the midpoint. Jack Parker’s remarks [Text Audio] include his thoughts on a possible matchup with BC at Fenway Park sometime down the road. BU has played outdoor hockey numerous times in the distant past. Sixty-seven years ago yesterday, the Terriers upended UNH at an outdoor rink in Durham, as described on our THIS DATE IN TERRIER HOCKEY page. Most college hockey games are played on the weekends, so that leaves plenty of time during the week for the hockey version of hot stove league---peering into the future. With the first pairwise rankings out, InsideHockey’s Tim Rosenthal took a shot at projecting the pairings for the four NCAA Regionals. His “bracketology” has the Terriers meeting Air Force Academy in the Northeast Regions to be played in Bridgeport. The 2009 WJCs are barely in the rear view mirror, yet a few bloggers already have candidates for next year’s Team USA rosters in mind. Nathan Fournier of The World of Junior Hockey suggests defenseman David Warsofsky and incoming blueliner Max Nicastro, along with forward Vinny Saponari (photo), all merit strong consideration. Chris Dilks The Western College Hockey has both Terrier defensemen among his candidates. The Salem News reports that 1965-86 Terrier co-captain Peter Marshall’s daughter, Kellie, is a standout defenseman for The Pingree School and, like her father, the junior is also a captain. We reported in the summer on Tom O’Regan Jr., son of the 1982-83 BU co-captain and former Pittsburgh Penguins Tom Regan. The younger O’Regan, who played midget hockey for the South Shore Dynamos in the fall, now is a junior at St. Sebastian’s, where he’s become an important offensive contributor to the Arrows, who are off to a 9-3 start.